BOSE Full Wire Replacement Service For Headphones Visit Fix My Headphones Today Includes 3 Months Warranty & Free Return Postage! ViaBlue EPC silver headphone cable have a tinned copper wires as a centre conductor, a silver-plated spiral shield and an aluminium PET film screen to completely shield all the faults, such as DECT or mobile phones, microwaves and mains hum, on all frequency ranges. The complete cable system is protected through a soft taping and protected with a flexible and satin sheath. Through this combination and specific composition of the chosen materials as well as the high-purity OFC copper, a complete and balanced sound map is achieved, that technically allows all frequency ranges to be linear and unaltered. Mogami Neglex quad cable is perfect cable for home studios suffering from wiring and grounding problems. Mogami 2534 should also be used where intense RFI interference is a problem. Mogami 2534 provides an improvement in signal to noise of 10-20db over equivalent twisted pair cables. Double conductors quad cables are more effective in canceling noise that can get past even the best of shields and is critical in an environment of high RF and EM interference. Conductor insulation is XLPE ( Cross-Linked Polyethylene) which has excellent electrical characteristics and prevents shrink-back during soldering. W2534 has become popular around the world as the standard for high quality digital and analog recording. The cable has also become popular for use with unbalanced equipment, such as high quality pre-amp, amp inputs and tape decks. Miniature Quad Superflexible Microphone Cable Originally designed for BANTAM patch-cords, this cable has become popular where a small diameter Quad mic cable is required. The star-quad design for microphone cables, where four conductors are used in pairs, with a short lay length, to cancel out the effects of external electromagnetic noise, is well known in demanding applications such as TV, video and theatre where thyristor lighting control systems are in use. The cables are, of course, also suitable for line level signals. The L-4E5AT design is an installation cable with foil screen and drain wire. Kevlar strands are incorporated into the lay-up to help prevent damage due to stretching when cables are pulled through ducts and conduits. An irradiated polyethylene core insulation provides a low-capacitance dielectric, and its high temperature resistance minimises run-back during soldering. Van Damme Tour Grade Classic XKE Microphone cable combines flexibility, durability, noiseless operation and excellent handling characteristics. Now upgraded with more advanced PVC jacketing materials. Van Damme microphone cables can be found in film and recording studios, high street music shops, professional touring applications and the education sector. 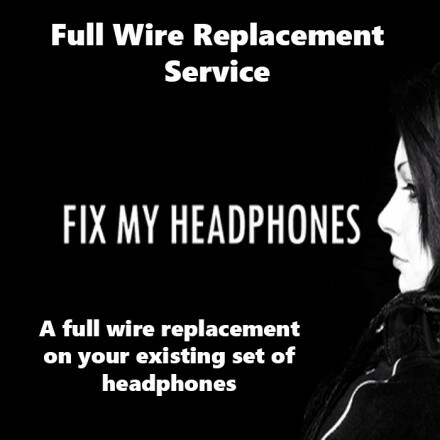 At Fix My Headphones our standard cable is ideal for earphones but can also be used with some headphones. The cable itself is cut to the same length as the original earphones and fitted in it's place. Our cable is 5n OFC Soft Cable and is an ideal substitute for most original cables. The cable is a tough replacement and match for any earphones or headphones our there and for the approx size of 1.7mm you will be surprised how durable this cable is. This is the thinnest cable we use at Fix My Headphones. The cable is black in colour there is no alternative colour. This cable does not provide shielding. This cable is ideal for people on a low budget. © 2019 Fix My Headphones. All Rights Reserved.